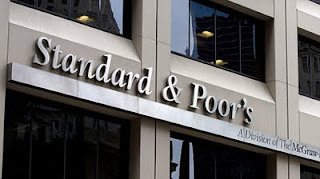 Friday evening at 8:11pm, the US ratings agency Standard & Poor's (commonly referred to as S&P) went public with an historic downgrade to the US credit rating. Since 1917, the United States has always maintained a AAA credit rating and since 1941 from S&P. On July 15, S&P put the US credit rating on CreditWatch Negative. This is essentially a warning that the credit rating could be negatively impacted. As of Friday evening, Moody's and Fitch have reaffirmed their AAA credit rating of the United States. With this ratings downgrade, are we seeing the first back lash from the compromise debt-ceiling/budget deal that was passed Tuesday afternoon or are we seeing a rogue ratings agency looking to scrub blood from their hands? Usually when I hear a ratings agency threatening to downgrade or advising of future negative impact, I tend to ignore them. The ratings agencies have been given too much power over the years and have proven to us that they are pawns to the private sector. Over the next few days, we will hear from every economist reputable and not so reputable and we will hear the corporate spin from those who seek to benefit from the services of S&P and highly rated private sector leaders who back S&P's decision. I am not an economist but I have an in-depth understanding of their work and I once worked for one of the investment banks that S&P overrated during the financial collapse of 2008. S&P has a history here, so I think it is very important that we take a thorough look at S&P and their decision to downgrade the US credit rating. More importantly, their reasoning. "The political brinksmanship of recent months highlights what we see as America's governance and policymaking becoming less stable, less effective, and less predictable than what we previously believed. The statutory debt ceiling and the threat of default have become political bargaining chips in the debate over fiscal policy. Despite this year's wide-ranging debate, in our view, the differences between political parties have proven to be extraordinarily difficult to bridge, and, as we see it, the resulting agreement fell well short of the comprehensive fiscal consolidation program that some proponents had envisaged until quite recently. Republicans and Democrats have only been able to agree to relatively modest savings on discretionary spending while delegating to the Select Committee decisions on more comprehensive measures. It appears that for now, new revenues have dropped down on the menu of policy options. In addition, the plan envisions only minor policy changes on Medicare and little change in other entitlements, the containment of which we and most other independent observers regard as key to long-term fiscal sustainability." Here is the problem with this rationale: the job of a ratings agency is to rate risk and provide analysis to investors, using accurate math, an analysis of market factors and simple probability. THAT'S IT! It is not the job of a ratings agency to evaluate politics or use the political climate as a tool to make ratings decisions. If S&P is now telling us that they will use everything other than math to determine ratings, then where were they in 2001? Prior to the bankruptcy of Enron, Moody's and S&P maintained "investment grade" status on Enron (AAA through BBB rating) up until 4 days prior to their bankruptcy. Again, where were they in 2008? Both S&P and Moody's, had Lehman Brothers rated AAA prior to the September 15, 2008 collapse. S&P also freely handed out AAA ratings to junk investments, giving them some responsibility for the 2008 financial crisis. This sounds to me like an agency an industry trying to right its wrongs on the backs of the American People. S&P has blood on its hands and they are now looking to wash them clean, make an example and try to prove that they are a relevant, legitimate organization that deserves the merits they have been given. S&P took a bold leap here and they are hoping it pays off in the long-run, should we deal with additional economic turmoil. S&P wants to say "see, we told you, that's why we downgraded the US. We knew this was coming and we were the first agency to call it." S&P has contradicted their own rationale here, because they have taken a position, and that position is on the entire Budget Control Act of 2011. They’ve acknowledged that there is some uncertainty due to the timing of implementation and the legislation's call for the Congressional Joint Select Committee to address the final position on the deficit reduction in November 2011. Why didn't S&P wait until after November to decide if the credit rating indeed needs to be downgraded? "I don't get it. In Omaha, the U.S. is still triple A. In fact, if there were a quadruple-A rating, I'd give the U.S. that." "No. Remember, this is the same group that downgraded Berkshire." There is also an issue of bad judgment and a $2Tr. mathematical error on S&P's part, an error that S&P admits they made, but has chosen not to rectify in the rating or their rationale. S&P has said their decision to downgrade the U.S. was based in part on the fact that the Budget Control Act, which will reduce projected deficits by more than $2 trillion over the next 10 years, fell short of their $4 trillion expectation for deficit reduction. Clearly, in that context, S&P considers a $2 trillion change to projected deficits to be very significant. Yet, although S&P's math error understated the deficit reduction in the Budget Control Act by $2 trillion, they found this same sum insignificant in this instance. In fact, S&P’s $2 trillion mistake led to a very misleading picture of debt sustainability – the foundation for their initial judgment. This mistake undermined the economic justification for S&P’s credit rating decision. Yet after acknowledging their mistake, S&P simply removed a prominent discussion of the economic justification from their document. In their initial, incorrect estimates, S&P projected that the debt as a share of GDP would rise rapidly through the middle of the decade, and they cited this as a primary reason for a downgrade. In S&P’s corrected estimates – which lowered S&P's projection of future deficits by $2 trillion over 10 years and lowered S&P's estimate of debt as a share of GDP in 2021 by 8 percentage points - public debt is much more stable. Specifically, CBO calculated that the Budget Control Act, including its discretionary caps, would save $2.1 trillion relative to a “baseline” in which current discretionary funding levels grow with inflation. S&P incorrectly added that same $2.1 trillion in deficit reduction to an entirely different “baseline” where discretionary funding levels grow with nominal GDP over the next 10 years. Relative to this alternative “baseline,” the Budget Control Act will save more than $4 trillion over ten years – or over $2 trillion more than S&P calculated. (The baseline in which discretionary spending grows with nominal GDP is substantially higher because CBO assumes that nominal GDP grows by just under 5 percent a year on average, while inflation is around 2.5 percent a year on average. The impact of this mistake was to dramatically overstate projected deficits—by $2 trillion over 10 years. As anybody who has followed the fiscal discussions knows, a change of this magnitude is very significant. Nonetheless, S&P did not believe a mistake of this magnitude was significant enough to warrant reconsidering their judgment, or even significant enough to warrant another day to carefully re-evaluate their analysis. S&P acknowledged this error – in private conversations with Treasury on Friday afternoon and then publicly early Saturday morning. In the interim, they chose to issue a downgrade of the US credit rating. Note: Ratings from ‘AA’ to ‘CCC’ may be modified by the addition of a plus (+) or minus (-) sign to show relative standing within the major rating categories. Looking at this from a more logical prospective than the average political talking head, I am going to side with the US Treasury. Standard and Poor's has made a grave error and should be forced to rectify it. Their rationale, granted I agree with their assessment of our current political climate, is not applicable to assessing the nation's credit rating and ultimately issuing a downgrade. S&P should not be allowed to make such a miscalculated error and get away with it. If any of us made such a grave mistake at work, we would be out of a job. They should have kept the US on CreditWatch with a possibility of negative implications and made an assessment once the Budget Control Act of 2011 is brought to completion when the Congressional Joint Select Committee on Deficit Reduction makes and implements its recommendations in November 2011. We have enough political games being played in congress and corporate America, the last thing we need is the ratings agencies throwing their hat into the ring. Additionally, neither side of the political spectrum should use this to magnify their specific viewpoints or political ideologies. Should S&P have downgraded the US credit rating? Do you agree with S&P's rationale? Have we given the rating agencies too much power? Can you name any time earlier in our history when the US credit rating should have been downgraded?